So far, we have covered the history of Chinese property and equity market growth from before the 2008-2010 global credit crisis till now and have clearly shown that the Chinese property market is rolling over (downward) after the 2016 regulations were put into place to curtail the mass exodus of capital from within China. We have also gone over many of the correlative economic items that point to the fact that a 15~25% correction in any one market segment, property, equity, credit/debt or global markets that result in capital risks for China, could drive a contagion effect for the Chinese investors/government. In other words, a simple 10~20% price decline in two or more of these markets could put enough pressure on the Chinese that capital reserves could diminish dramatically as well as some level of investor panic could set in to drive a “death spiral” type of event. Throughout all of 2017, the Growth Rate of Investment in Real Estate Development averaged near 8.1%. Beginning in early 2018, this level shot up to 9.9% – the highest level in over 13 months. Growth of Land Area Purchased over the same period showed signs of increase over 2017 – averaging near 11.2% or so throughout 2017. The values of this indicator near the end of 2017 were above 15%.. Whereas the 2018 levels show a -1.2% growth rate. In one month span, the level of this indicator fell -17%? The Growth Rate of Floor Space and Sales of Commercial Buildings continued to decline throughout most of 2017. Starting near 25~26% and ending the year near 10% – a -15% decrease. What we found very interesting is that Sales of Commercial Buildings increased 1.6% in early 2018 while Floor Space sold decreased 3.6%. 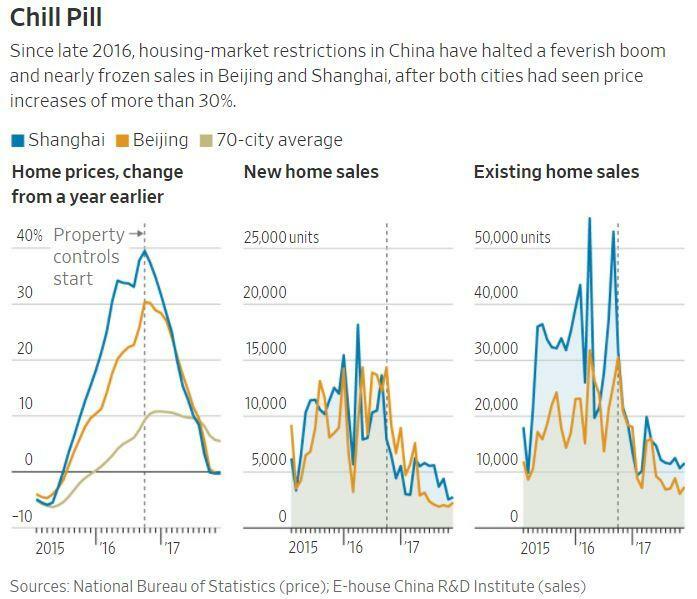 It would appear the Chinese central bank is willing to lend to property buyers while floor space buyers are falling off the map. Our primary concern with regards to any type of Chinese or Asian credit market collapse is that the recent 5 to 7+ years of outward capital expansion, expanding investments outside of China/Asia in support of lofty objectives and fuzzy real/return values, may have prompted a massive sub-standard debt issue that could become very dangerous for the world. 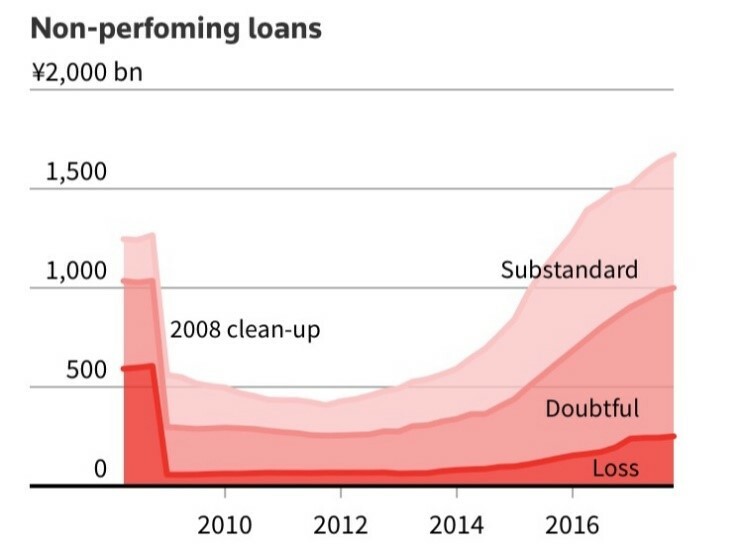 We’ve all been reading of the issues of Non-performing assets and loans in China recently. These types of credit/debt are the same types of instruments that led to the 2008~2010 global credit crisis. Imagine the Chinese economy as both a local organism (contained to only the China/Asia general region), but also as an international organism (depending on external sources for essential life sustaining components – like the US and UK for purchases and the other emerging markets for growth projects). Now, imagine these external sources experience an extended 10~35% general asset decrease over a period of 3~5+ years while the US Federal Reserve, and other central banks, tighten the credit markets and push up borrowing costs. If China is dependent on these outside sources for essential economic sustaining components, then the economic balance they depend upon could become threatened – if not even more fragile than we have already examined. Yet, consider one additional component of this hypothetical exercise. Consider that the Chinese property and equity markets experience a moderate contraction event (say 10~20+% lower over 2~3 years) while the US and other established economies continue to push up the borrowing costs with rising interest rates. We have long believed that capital migrates into the most healthy and opportunistic environments, with ease, and as capital migrates to new sources of returns, it leaves deteriorating economies in a “death spiral” for a period of time. Capital that is unable to quickly move to new opportunistic sources may become trapped in these contracting economies for many years or decades. 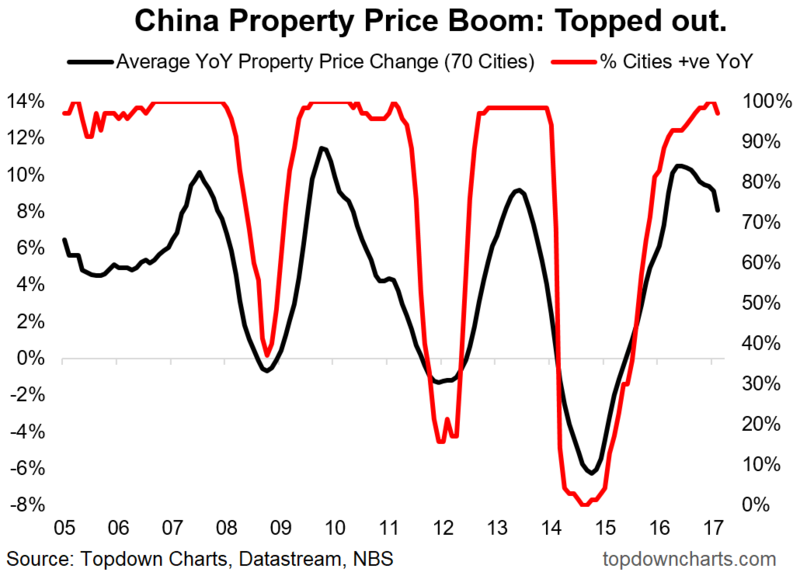 China’s property market cycles have topped out as well, indicating a strong potential for further contraction in the real value of property assets. Combine this with a global central bank tightening and recently announced US/China tariffs and economic positioning and we have the making of another Global Crisis event – this time originating in China/Asia as the Chinese Dragon economy bursts. 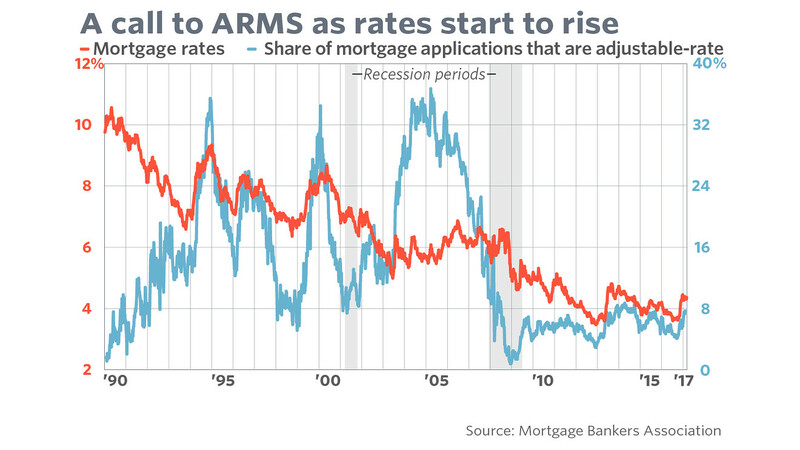 As US mortgage rates continue to climb above 5%, the inevitable economic tightening across the US and globe will continue. The attempt to move China away from a US Dollar based economy and become more focused on the Chinese Yuan will, in our opinion, be a difficult transition over many decades. We believe the Chinese/Asian markets are on the cusp of a potentially dramatic collapse and the recent news of US and Chinese tariffs do nothing more than exasperate the current issues. Pay very close attention to the surrounding Asian markets as we continue to watch for breakdown events. In the next, and last, portion of this series, we will attempt to present our final conclusions and expectations for traders and investors. We have attempted to clearly illustrate our detailed China/Asia market research and the potential for a dramatic price decline in the immediate future. We’ve outlined how this incredible opportunity for investors was setup, almost perfectly, by the global recovery efforts after the 2008-09 credit crisis. 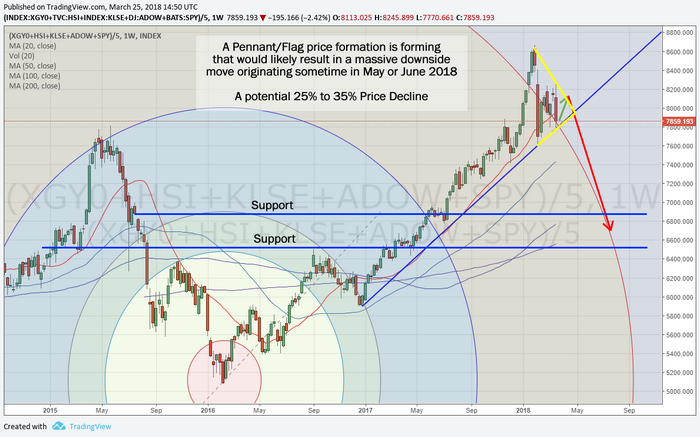 At this point, it would appear the Chinese Dragon economy is on its last leg and we are well positioned to take advantage of the next big move. If you find our research valuable and want to learn how you can stay on top of these moves while profiting from them, visit www.TheTechnicalTraders.com to learn more about our services and memberships. We work very hard to keep our members aware of these types of opportunities and make every effort to deliver successful results for our valued members. We hope to see you in the members area soon where we can share more insightful analysis and research.